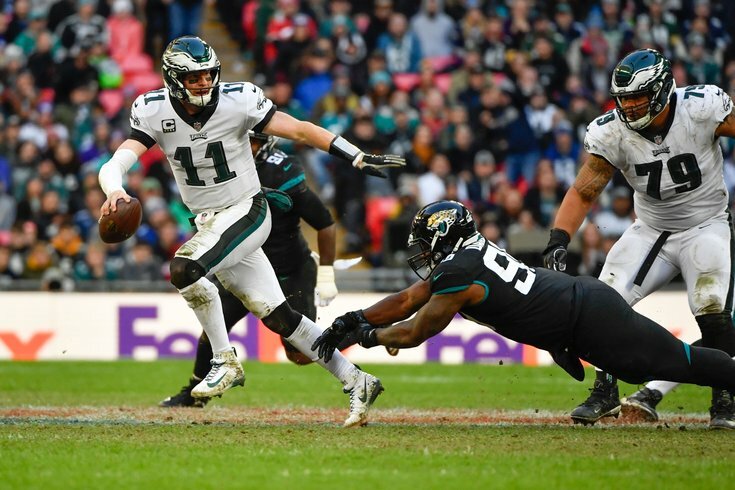 Philadelphia Eagles quarterback Carson Wentz scrambles during the third quarter at Wembley Stadium. Behind a productive second half from the offense and a bend, don't break effort from the defense, the Eagles are back on track and back at .500 through eight weeks. Philadelphia heads into their bye week with a victory, following a 24-18 victory over the Jacksonville Jaguars in London. It was a much-needed win, and now the Birds get to recharge for a week and get things in order for a second-half push. Here's what I saw in the win. NFL trade rumors: Are Eagles in on DeSean Jackson, Ha Ha Clinton-Dix or DeVante Parker? • One of the positives from the game on Sunday was Jim Schwartz's increased willingness to add pressure up front. The Eagles under his watch tend to rush four and rely strictly on the defensive line to generate pressure, and it has not always been a winning formula for the Birds. The Eagles blitzed more frequently against Jacksonville, and it paid dividends all throughout the game. Even when they weren't able to get to Blake Bortles for a sack, they made him uncomfortable, and the Jags' quarterback struggled to do anything with the added hands and bodies in his face. Schwartz doesn't need to be Jim Johnson in his aggressiveness, but selective use of the blitz can go a long way for this group by keeping opponents on their toes. Rushing four gets predictable, and it's part of why the Eagles have struggled to come up with sacks and pressure late in games. • After turning in some completely ineffectual work over the last month or so, Josh Adams finally looked like a real contributor on Sunday morning. A big reason why? The Eagles didn't ask him to do things that are outside of his skill set. You may recall the Eagles running several outside toss plays for Adams this season, all of which ended in pain for Philadelphia. Against Jacksonville, they asked him to make more "big back" runs, giving him the ball between the tackles and trusting him to burst through the line. Adams busted off a nice run for 21 yards early in the second half, and looked more comfortable than he had all season. Sometimes, it's as simple as play calling and personnel matching one another. • Carson Wentz has missed Wendell Smallwood a couple times on pass plays in the last two weeks, but it would have been tough to miss him on the designed screen Smallwood took to the house early in the second half. The Eagles' blocking was excellent on the play, and Smallwood did the rest of the work on a well-executed play. The unsung hero on this play — Shelton Gibson, who did not let his stature stop him from making a tremendous downfield block, turning what would have just been a long gain into a surefire touchdown. The little things make all the difference, my friends. • This was the first week where we really saw Carson Wentz start to use his athleticism to his advantage. His escapability in the pocket was not at its highest level, but he made effective use of his legs to pick up a few critical first downs throughout the game. With Wentz coming back from a devastating knee injury, it's not surprising that he'd be a little gunshy running the ball or that the team would discourage him from putting himself in harm's way more than is necessary. But selective use of that option is part of the reason the Eagles were so tough to stop on third down last season, and they were excellent in that regard against Jacksonville. Wentz's legs are part of the reason why. • Ho hum, another week, another hookup between Wentz and Zach Ertz to get into the end zone. No big deal. Ertz has been an absolute monster this season, pacing tight ends around the league and combining the best of both worlds at the position, chewing up yards over the middle while serving as a reliable target in the red zone when things buckle down. The drive this touchdown capped off, by the way, is exactly what the Eagles have been missing in their losses this year. Rather than buckling under the pressure with Jacksonville drawing closer, Philadelphia marched right down the field and put some breathing room between themselves and the opponent. That's just as (if not more) important as executing in two-minute drills — if you stay on the front foot, you don't have to worry about the game being on the line in the closing moments. • It feels foreign to type this — great coverage from the Eagles on a critical fourth-down play late in the fourth quarter. The secondary was aided by a monster series from Fletcher Cox, who knocked down a pass from Bortles on third down and got in the quarterback's face on the decisive play, forcing him to make a quicker decision. Cox brings it every single week, all four quarters. Lots of players have gone down on this Eagles team, but Cox is one of the few irreplaceable cogs. • Small shout out deserved for Jordan Matthews, who didn't pad the numbers with lots of receptions but made his count when the ball came his way. • Great rally in the second half from Wentz after turning the ball over twice in the first half. He is not quite at his MVP level from last year, but he has been much better than he probably has any business being coming off a major injury. The future is bright. • It would be cool if Jim Schwartz's defense could come up with a stop following long Eagles touchdown drives. After the Eagles marched 95 yards to bump their lead to 17-6, a stop by the defense could have started the avalanche that put the game out of reach. Instead, they allowed Jacksonville to convert a crucial third-down play early in the drive that followed, and Blake Bortles of all people marched them right down the field and back into the game. Not great. • Schwartz may have been more willing to blitz on Sunday, but his insistence on playing soft zone was just as infuriating as it has been when the Eagles have held leads the rest of the year. After accepting a penalty to put Jacksonville in a first-and-20 situation to kick off the fourth quarter, Schwartz instructed his defense to sit back in zone on the ensuing play. It should not have been a surprise to anybody that they picked up 13 yards on that play, erasing the advantage they gained by accepting the penalty to begin with. It's ridiculous to watch this every week and not see any adjustment to how they approach playing with a lead. Teams carve them up underneath, get some momentum building, and then eventually reaching pay dirt as a result. It's not the yards given up that ultimately matters — long drives are nothing without points — but the total concession of space adds up over time and eventually leads to those scoring plays. • Jason Kelce is one of the smallest concerns on Philadelphia's offensive line week-to-week, so don't need to harp on a mistake too harshly. But boy did he make the wrong decision on a third-down play late in the third quarter, sliding left and allowing Myles Jack to run untouched at Wentz for a sack. Not want you want to see in the interior of your offensive line. • If the Eagles can exchange Dexter McDougle for an order of fish and chips on their way to the airport, they should probably take it. • Philadelphia's offense got a huge break when Josh Adams was rule down on a near fumble late in the game. What did they do with it? They allowed Wentz to take a sack on second down, and threw a screen pass to Agholor for minimal/no gain on third down. So before jumping all over the defense for their respective struggles, keep in mind that the offense has been just as big (if not a bigger) problem for a lot of this season. This was a good day for this group and they killed the game off in the end, but they still need to find their form. • As much as it's easy to yell about Jalen Mills when he gets roasted on a deep route, the Eagles don't exactly have a plethora of secondary options to replace him. So seeing him down on the field early in the second half was a worrying sight, and it got more concerning once you saw him get carted to the locker room. It was made worse with news that came during the corresponding break in the action that Lane Johnson was done for the day as a result of a knee issue. We'll have to wait and see how serious that ends up being, but losing two starters mid-game is not a formula for present or future success. It's a brutal call and one that only fuels the fire for people who think football is becoming less fun to watch under the new rules. Protecting players is good, showing no ability to accurately do so in real time is bad.